The next morning Beau headed back home (he had driven us over and spent the day relaxing at the resort with us) and the kids and I headed off with Gigi and Pops (my parents.) Pops had an appointment downtown so instead of the kids and I waiting around in a boring waiting room they dropped us off down the street at the Houston Zoo. Abby wasn't too happy that Gigi wasn't staying with us but quickly cheered up. We started in Micah's favorite area of the zoo - the monkeys. Oh boy did they have lots and lots of monkeys. Lots more than our zoo back home. 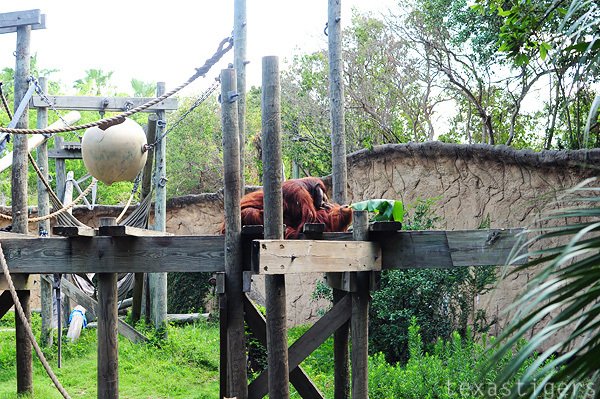 The favorite was the Abby-orangutan. Ha! 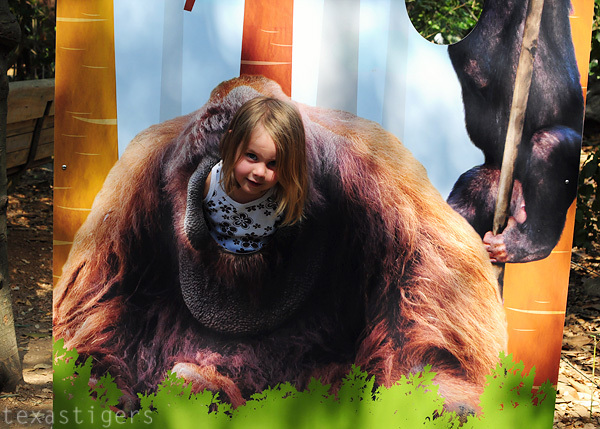 They do have a whole family of orangutans - something our zoo doesn't have - we only have smaller monkeys at our zoo. Only one of them was out though. According to the sign with their names and such I think this one was named Doc. We got to see the lions up close! This never happens back home because our lion exhibit has the big moat separator and they tend to hang in the back of their area. 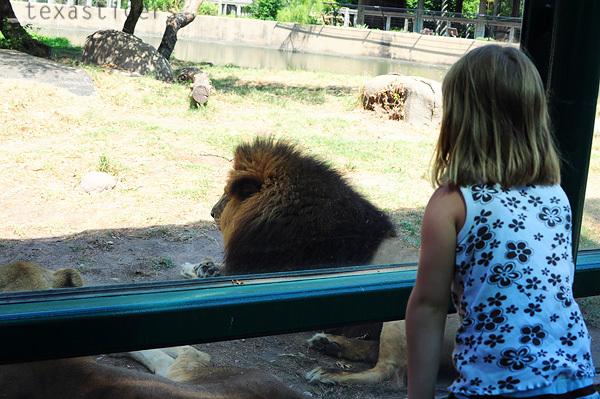 These lions had a glass window and they were relaxing right next to it in the shade. About an hour into our zoo trip we made our way to the giraffe enclosure. We saw a baby relaxing in the shade. Then we saw it was feeding time and Abby asked very sweetly if we could feed them. 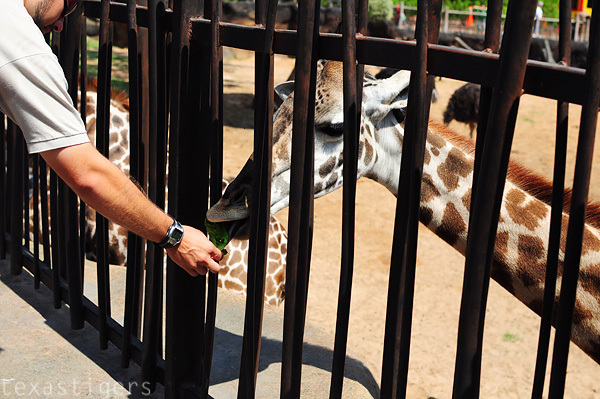 Since it's not something we could do at our zoo (we don't even currently have a giraffe - they had at least 5 here that I saw) I agreed and we paid the $5 for 3 pieces of lettuce. It was a neat experience. Too bad I wasn't ready with the camera and by the time I passed out the lettuce to the kids and got the camera ready they were already feeding them so I didn't get a picture of the kids actually feeding them. 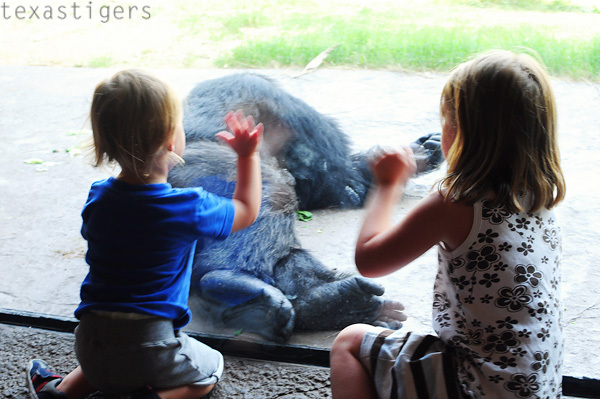 In this zoo's Africa section they had a large chimpanzee exhibit and like the lions they liked the lounge near the glass windows in the shade. 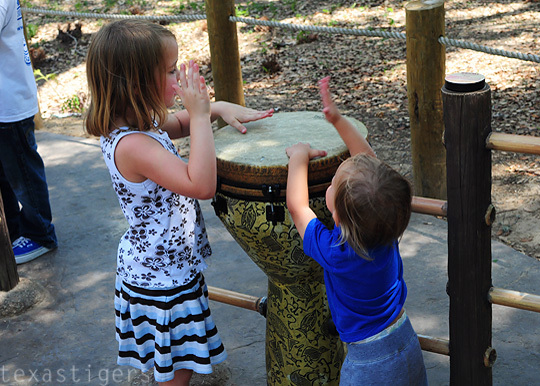 There were drums to play as well which both Abby and Micah liked - in fact Micah didn't want to stop and continue on. 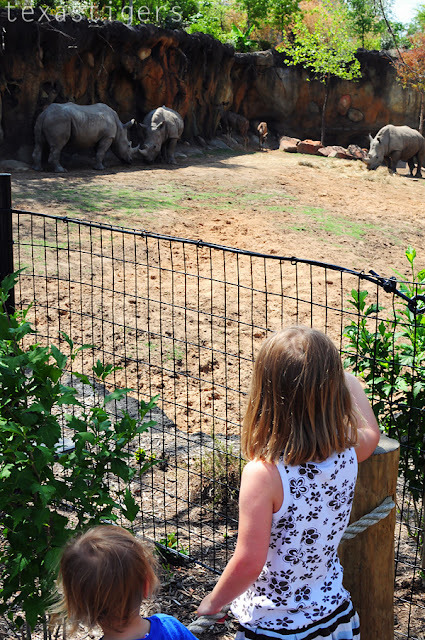 Then we saw the rhinos. They had a very nice exhibit for them compared to our zoo. 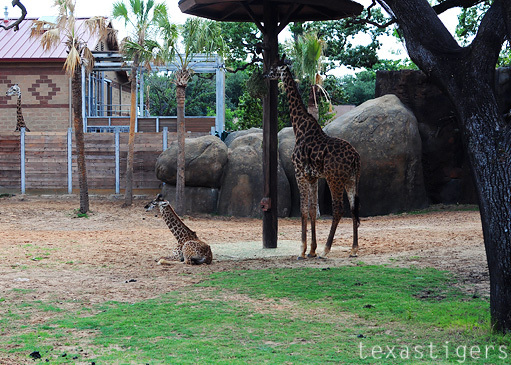 In fact many of the Houston zoo exhibits I thought were much nicer than our zoo and I think our zoo is pretty nice! After the Africa area we finally found the elephants. Because of the construction (they are building a bigger elephant area) the way the map and signs show to get to the elephants isn't accessible so instead of seeing them first and seeing them get their bath we saw them towards the end of our visit by the time we got over there. It was okay though because they had just gotten some lunch and we were able to see the babies - yes babies plural - they had 2. Can you find both of them? If you didn't se the second one he/she? is over on the left next to his mama (I assume that's mom!) That one was the littler of the two. Our last stop on the way out was the frog/snake/reptile house. 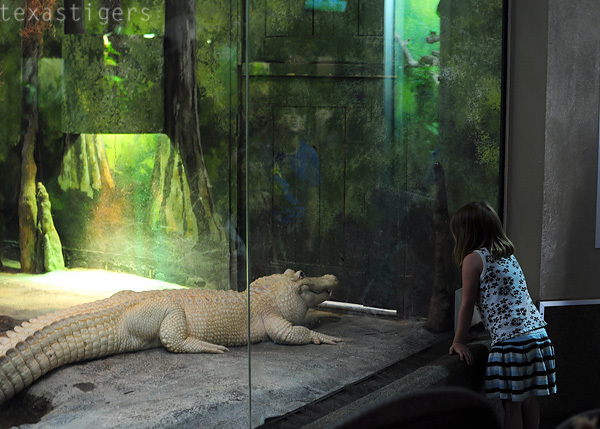 In there they have an albino alligator which Abby was very amused by since it was a first to see a white alligator. We also saw lots of snakes and frogs. 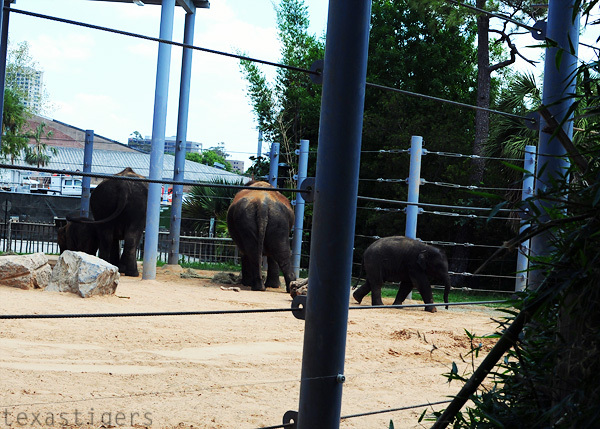 That was our visit to the Houston zoo. All in all a very fun zoo to visit. It's huge and we didn't see everything but lots of shade that made the heat of the day a little more tolerable. Gigi picked us up from the zoo, we got some lunch, picked up Pops from the last part of his appointment and took one more little stop at my favorite place - Sprinkles cupcakes! Delish!!! And then we were off to finish off our already long day with the drive to Gigi and Pops house 2 hours down the road. It was cute because Abby decided they should play quiet time on the drive and so Gigi was sitting in the back between the kids and they all pretended to sleep. Micah who didn't really "get" the game finally caved and won taking a nap for 2/3rds of the drive. Today we've kept busy running errands in preparation of our beach trip next week and our stay here at Gigi and Pop's house!